Stentorceps weedlei Nielsen & Buffington, 2011. Type in: National Museums of Kenya (NMKE). dorsal to the clypeal medial protuberance. Most easily confused with S. zuparkoi in all other aspects except for the shape of the pyriformprotuberances: S. weedlei has broad pyriformprotuberances, while those of S. zuparkoi are thin. Etymology Named in honour of the creature Weedle, a hymenopteran larva from the Pokémon video game series (Game Freak, Creatures Inc., 1998). Weedle shares the distinguishing character of S. weedlei, a spine in the middle of its head. Holotype Name registration. urn:lsid:zoobank.org:act: 888D394F-DA01-4BA7-BDA4-BA364873AFDB. Type material. 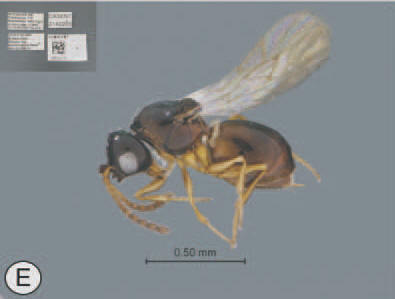 Holotype, female:MADAGASCAR: Fianarantsoa Auto. Province: Vohiparara, broken bridge, high altitude rainforest, MA-02-09A-01, Ranomafana National Park, 21°13.57’S 47°22.19’E, 1100 m, 16.x–8.xi.2001, malaise trap, M. Irwin & R. Harin’Hala, USNM ENT00655745 (deposited in CASC). Nielsen, M. & Buffington, M. 2011. Redescription of Stentorceps Quinlan, 1984 (Hymenoptera: Figitidae), with a description of five new species. African Entomology 19: 597–613. Quinlan, J. 1984. Stentorceps, a remarkable new genus of eucoilid (Hymenoptera) from Africa. Systematic Entomology 9: 479–485. urn:lsid:zoobank.org:pub: B28A151C-9622-4EAD-9C5C-B1D5668C9DB7. Photographs © Nielsen & Buffington. Matt Buffington (Systematic Entomology Laboratory, USDA/ARS) and Mattias Forshage (Swedish Museum of Natural History) both played an integral role in the development of the Cynipoidea pages.